How it works and how it came about – if you’re interested! 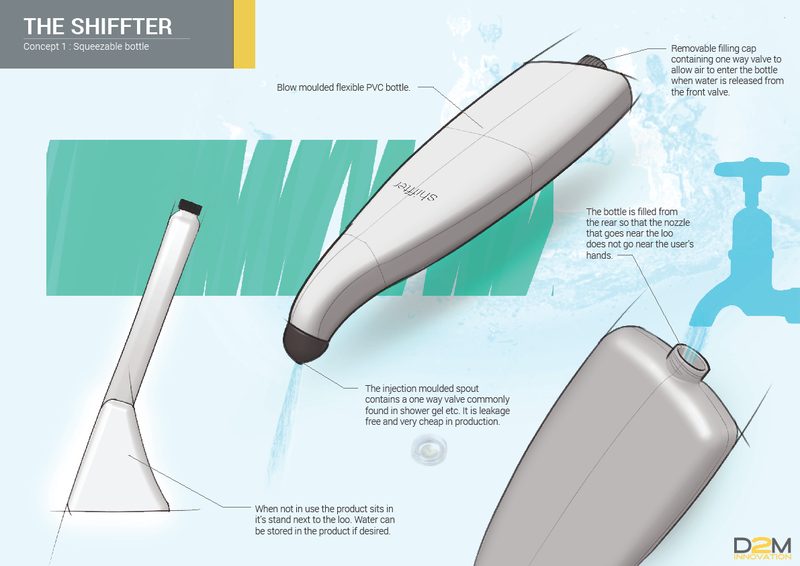 We have an international patent application pending for the Shiffter as it isn’t just a squeezy bottle – although that is where the original inspiration came from! 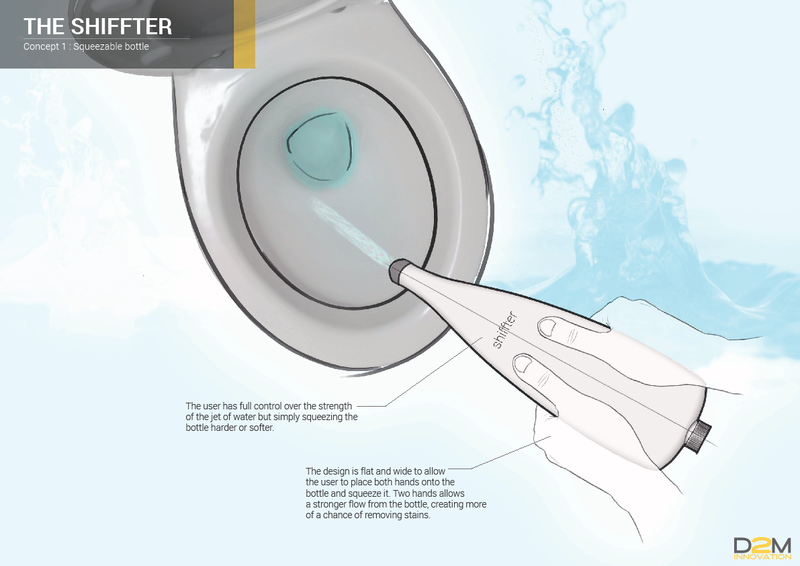 The Shiffter came about by accident after its inventor, Kam Mistry, visited the toilet one day. With the flush not cleaning the bowl properly he decided, as many of us would, to grab the bleach bottle to see if he could clean it up by squirting bleach onto the bowl. As you probably know, squirting bleach is a desperate measure and isn’t remotely effective as the bleach is really thick and therefore doesn’t come out of the bottle fast. On this occasion the bleach bottle was just about empty, so he took the lid off and filled it with water. However, having filled it with water, he noticed that the low viscosity of the water (compared to the thick bleach) meant that squeezing the bottle allowed the water to jet out under high pressure and effectively jet wash the remnants from the toilet bowl much more effectively than bleach…and much less disgustingly than having to use a toilet brush. Eureka! Of course it’s easy to get carried away and think ‘What a great idea for a product,’ but he initially talked himself out of it. Why? Because, if it can be done with an empty bleach or toilet cleaning fluid bottle then why would anyone pay for the something that does the same? DESIGN – many of us really care about interior design and how our homes, including our bathrooms, look – a stylish product looks much nicer than a tatty bleach bottle left next to the toilet. An old bleach bottle won’t look too good in your bathroom especially when the label peels off leaving sticky glue stains on it…and it’s considerably cleaner than a dirty toilet brush! So, he decided that making a product was indeed a good idea and there was a market for it. Having decided to go ahead, an initial design concept was drawn up with a design company – unfortunately it didn’t have the ‘wow’ factor and was going to be too expensive to manufacture. Essentially it was a squeezable bottle – quite similar to a bleach bottle – that looked nice. So Kam decided to look for another product design company. He was fortunate to be able to find D2M and coincidentally they were only about half an hour away from his home town of Cheltenham. D2M stands for ‘design to market’ – which is just the type of help he needed, someone who could turn the Shiffter from an idea into a real, manufactured product. Having briefed Richard (the designer) on what he was looking for, D2M then came up with three design concepts. Here are the original sketches for the chosen design. It looked great and generally hit the spot but we needed to tweak it a little so that it could be filled horizontally rather than vertically, but the sketches above formed the basis of the current design. Nicely presented visuals too – I’m sure you’ll agree! These aspects meant that we’d created something simple, but at the same time something quite clever. Whilst there are no moving parts or batteries (which is also great for reliability) the simple, yet ingenious use of the water and air valves meant that we’d come up with something a bit special with intellectual property worth protecting. So the new design represented a significant improvement from the initial idea – a great design with improved practicality. Consequently we have a pending international patent application filed.